If only these spaces were mine... Where is a winning lottery ticket when I need one?? Definitely a winning combiantion....just stunning! Have a great day Tiffany. Both spaces are really beautiful but gosh, that bathroom! Love the look of that space! Love both of these spaces. I love high contrast so they definitely work for me. Plus, I like the combination of masculine (so it's not too fussy) combined with the rustic (so it feels homey)...a winning combination, I think! That bathroom vanity is gorgeous! I'm a huge fan of rustic touches. Incredible! I would be very happy with both of these spaces. LOVE! The bathroom is beyond gorgeous!! I would be excited to wake up everyday to get ready in there! 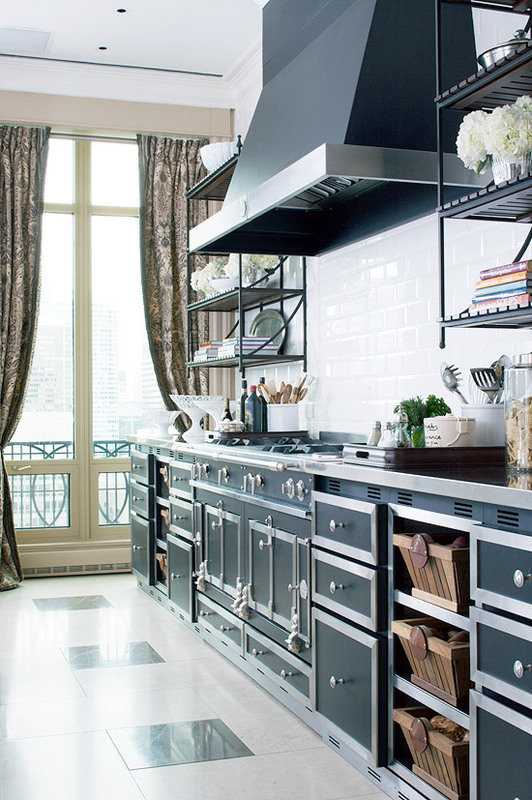 That kitchen is sitting in my inspiration files, too. I drool everytime I see a La Cornue range. Love the bathroom, too! Thanks for sharing. ohmigosh that bathroom is to die for! I do love me a bit o' rustic in my life! I usually gravitate towards rustic beamed ceilings. Can we talk about that honeycomb tile??? Amazing! Oh, that bathroom! Love, love, love it. Could you tell me where you found the bathroom photo, Tiffany? I'd like to find the source for the swing-arm bathroom lighting. I haven't yet found swing-arm lighting I like as much as this. I found your blog via Pinterest and am using this bathroom photo as the inspiration for our master bath renovation.